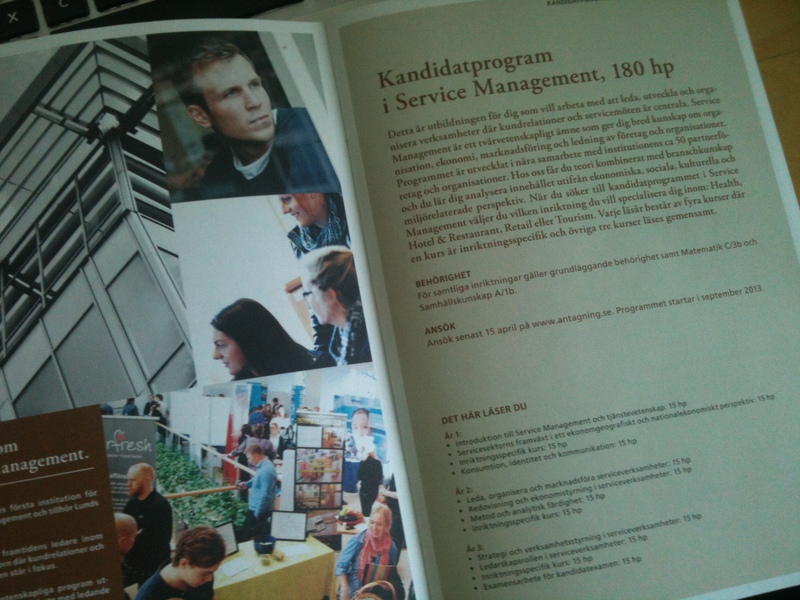 Sweden, 15h of March 2013 – the application period for bachelor programmes starts NOW. Yesterday was open house at Campus and hopefully you have been there to learn more about Service Management?! 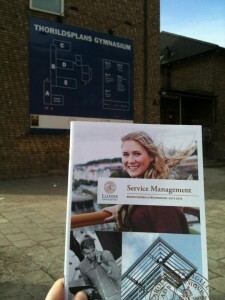 A quick peak into the Service Management brochure – if you have good eyes you can even read the list of courses. Otherwise you can check it out here. Sometimes, I must say, I am a little bit jealous of what the bachelors study here at the department of Service Management. Even though courses like “Redovisning och Ekonomistyrning” and “Strategi och Verksamhetsstyrning” sound like tough exams and probably like a nightmare for many students, they are actually courses that are so valuable out there in the real life of working. And I wish I would have had more of these courses. Studying Service Management means getting a modern management education, with many guest lectures and study visits so that you will always be in touch with this real life. Plus you can choose a specific focus, such a health or hotel and restaurant, which then gives you both a general but also a more specific education. I love it! I wish I could study a bachelor programme again! On my way to one of the schools. Maybe it’s yours? This week I have been in Stockholm and was on the mission to spread out some small course catalogs to several high schools. Maybe one of them was yours? Keep your eyes open for our cute little brochures and pick one up if you see them! 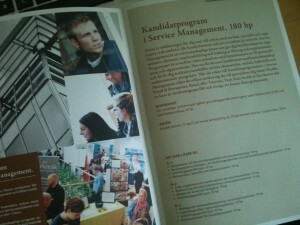 There you can find info about all our bachelor but also master programmes. And if you are curious about them and want to get some more info, read the blogs of my fabulous blog-colleagues, or contact them directly if you want to hear more! So now, get more info, apply via antagning.se and come study with us! We are looking forward to meet you! Det här inlägget postades i Absolut Student, Ambassadörsuppdrag, Health, Hotel & Restaurant, Intressant, Logistics, öppet hus, Retail, Studier, Tänkvärt, Tourism, Utbildning. Bokmärk permalänken.